HAVING commenced at the Liqui-Moly Bathurst 12 Hour earlier this year, the third running of the Intercontinental GT Challenge continues this weekend and it’s drawn an all-star field in the process. The Total 24 Hours of Spa will mark its landmark 70th edition in spectacular fashion thanks to a 68-strong entry list that features world-leading drivers, teams and manufacturers. | Grab your 2019 Liqui-Moly Bathurst 12 Hour tickets and camping online now! This year’s race will be a truly global contest, with entrants coming from Europe, Asia, the Americas, Australasia, the Middle East and Africa. Dozens of nationalities will descend on the Belgian Ardennes, to test themselves against the finest GT competitors at the sport’s most challenging circuit. No fewer than 13 major automotive brands will be present at the endurance classic, setting a new record for the GT3 era and continuing the sustained growth that the race has enjoyed during recent years. What’s more, the teams that will represent them are among the most accomplished and professional in the sport, having amassed countless race wins and titles between them. Several will compete with official manufacturer backing, demonstrating the importance placed on securing victory at the Total 24 Hours of Spa. Audi currently lead the third installment of the manufacturer-based ICGT series, following the dramatic victory at Mount Panorama by Audi Sport Team WRT and drivers Robert Frijns, Stuart Leonard and Dries Vanthoor. Mercedes-AMG and Porsche sit second and third, respectively, in the standings after the German brands locked out the Bathurst podium in February. Audi will again be strong contenders at Spa Francorchamps thanks to a 10-strong fleet of their R8LMS challenger entered. 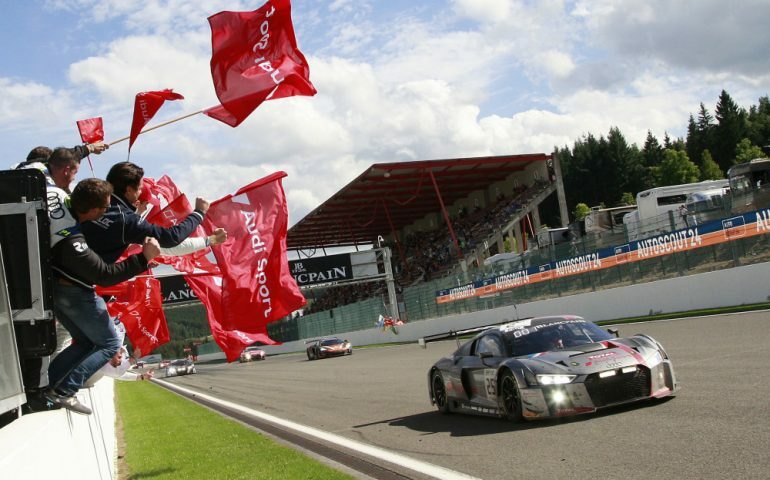 The Audi R8 LMS has clinched four overall victories at the Total 24 Hours of Spa since the race became part of the Blancpain GT Series in 2011. The German brand has once again demonstrated its commitment to the event with three factory-backed entries – including defending winners Sainteloc Racing – and one-off outings for the likes of Rene Rast and Marcel Fassler. There are a further four Pro class machines, including a one-off appearance by Land Motorsport, as well as additional cars in Pro-Am, Silver Cup and Am Cup. Aston Martin returns to the Pro category at this year’s Total 24 Hours of Spa thanks to a two-car effort from Swiss outfit R-Motorsport, with an accomplished roster of drivers set to pilot their V12 Vantage. There is further Aston Martin representation in the Silver Cup category, where the Oman Racing with TF Sport squad will field their full-season V12 Vantage, as well as a one-off Pro-Am entry from Brussels Racing. Having finished as runner-up at last year’s Total 24 Hours of Spa, Bentley Team M-Sport return with their two full-season entries as they look to go one better in 2018. In pursuit of this goal the British outfit fields a new-spec car and has added 2017 winner Jules Gounon to their driving talent. Bentley will also be represented in the Pro-Am category, where Team Parker Racing’s regular line-up of Seb Morris, Derek Pierce and Rob Smith will be joined by the experienced Andy Meyrick. With a grand total of 23 victories, BMW is by far the most successful manufacturer in Spa 24 Hours history and will be on the grid once again this year. ROWE Racing will field their usual two-car effort, Walkenhorst Motorsport will deploy their regular Am Cup entry and also add a Pro car that features 2016 Spa winner Philipp Eng and BMW factory ace Tom Blomqvist. The recent announcement that Emil Frey Racing will field its venerable Jaguar XK G3 at the Total 24 Hours of Spa took the number of brands represented at this year’s race to a record 13. The #54 machine will contest the Silver Cup class and sees Alex Fontana, Adrian Zaugg and Mikael Grenier looking to continue the fine form they have shown at Endurance Cup events. Ferrari’s 488 GT3 is the weapon of choice in the Pro-Am class, with five crews counting on the Italian machine and the likes of Alessandro Pier Guidi and Giancarlo Fisichella among the driving talent. In the Pro category, the #72 SMP Racing entry will look to capitalise on the excellent pace it has already shown this season. Honda will join the roll-call of global automotive brands contesting this year’s Total 24 Hours of Spa, with their NSX GT3 set to make its European debut at the twice-around-the-clock contest. Already a winner in its native Japan and the United States, the #30 machine will compete in the Pro-Am class with Bertrand Baguette and Esteban Guerrieri among its driving talent. Having clinched the Endurance Cup and overall Blancpain GT Series titles in 2017, Lamborghini will now look to conquer the Total 24 Hours of Spa for the first time. The Italian marque’s Pro class assault will be led by Grasser Racing Team, which will field its three full-season Huracan GT3s. The brand is further represented in the Silver Cup, Pro-Am and Am Cup classes, while one of its Super Trofeo machines will compete in the Groupe National category courtesy of GDL Motorsport. As such, Lamborghini will be the only brand present in every class at this year’s race. Having scored a remarkable breakthrough win at last month’s Circuit Paul Ricard 1000km, the Emil Frey Racing squad will travel to the Belgian Ardennes with renewed confidence in their Lexus RC F GT3. The Swiss squad’s driver line-up features two former Spa winners in Stephane Ortelli and Markus Palttala, strengthening their belief in this new-for-2018 car at the biggest race of the season. The #58 Garage 59 McLaren 650 S GT3 led for much of the Circuit Paul Ricard 1000km before eventually securing a podium finish. With that result adding to their confidence, Come Ledogar, Ben Barnicoat and Andrew Watson will be targeting the top step at Spa. They will be joined by the #188 Garage 59 crew of Chris Harris, Alexander West and Chris Goodwin, whose back-to-back Am Cup victories at Silverstone and Circuit Paul Ricard mark them out as class favourites ahead of the 24 Hours. Mercedes-AMG will be the best-represented brand at this year’s Total 24 Hours of Spa, with 13 of its cars contesting the race. Six of those will be in the Pro class. They will be led by four factory-backed efforts, including the Mann-Filter HTP Motorsport machine of Gary Paffett, Edoardo Mortara and Renger van der Zande. Formula 1 legend Rubens Barrichello will make his Total 24 Hours of Spa debut, driving a Mercedes-AMG GT3 for Strakka Racing. Nissan’s hopes for this year’s Total 24 Hours of Spa rest with GT Sport Motul Team RJN. The British outfit has vast experience of running the Japanese marque’s machinery and will field the new-spec GT-R NISMO GT3 at this year’s race, with Lucas Ordonez, Alex Buncombe and Matt Parry handling driving duties. A second entry will see the RJN outfit field an older-spec GT-R in the Silver Cup class. Porsche’s hopes of a seventh victory at Spa lie with a pair of impressive factory-backed Pro entries. The full-season Manthey Racing 911 GT3 R leads the line, with two-time Spa winner Romain Dumas certain to add vital know-how to their effort. They will be joined by the KÜS Team75 Bernhard machine of Timo Bernhard, Laurens Vanthoor and Earl Bamber to form a line-up that has won almost every major honour in sportscar racing. Porsche also dominates the Groupe National class, with three of its 991 Cup machines among the four-car field. Track activity begins on Tuesday 24 July with a three-hour bronze test. This is followed by festivities in the town centre on Wednesday, including the annual parade and driver autograph session. Qualifying will be staged over Thursday and Friday, culminating in the hotly-contested Super Pole, before racing gets underway from 16.30 CET on Saturday 28 July. With 68 GT3 cars embarking on the long road towards glory, the 70th edition Total 24 Hours of Spa will begin in truly spectacular style. Click Here for the provisional entry list.